This VIVIENNE WESTWOOD printed pony hair top handle handbag is a unique and clever cross between a hand bag and a wallet. 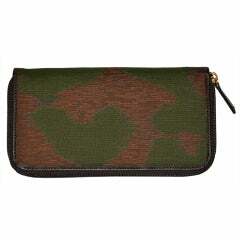 Beautifully crafted interior in olive green leather, features multiple compartments and card holders. A perfect travel companion. Iconic Westwood logo magnetic closure and printed customised Westwood lining. Prada black snakeskin-look leather document holder-type clutch/pouch. Silver-tone hardware with zipper closure to single compartment and branded push lock closure.